The Chaplaincy Services at The Shrewsbury and Telford Hospital NHS Trust are there for our patients, their families and our staff. People of faith and people of none. If you would like to speak to one of the Chaplains then please find the contact details in the blue box on this page, or feel free to just stop one of the team for a chat if you see them. 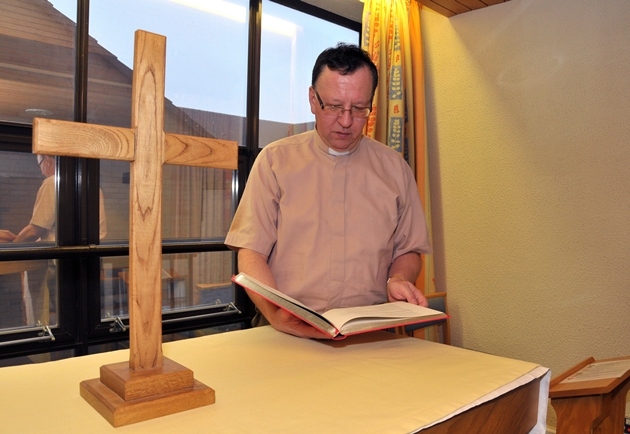 The Hospital Chapels are open 24/7 for the use of patients, staff and visitors. they provide a place for people to reflect, pray or just be quiet. There is a Pebble Pool in place of candles. For Muslims there are washing facilities, prayer mats and a sign locating the direction of Ka’bah. Holy Communion takes place at both hospitals at 10.30am on Sundays and everyone is welcome to join us. It can also be received on wards for patients who are unable to join us. Emergency Baptism or Blessings can be administered at the request of the baby’s family. Staff are able to contact the on-call Chaplain if requested. Anointing and Laying on of Hands can also be administered by the Chaplains. Non-Religious ceremonies of remembrance or reflection can also be organised on request. In an emergency, please ask a member of staff to contact the switchboard to alert the on-call Chaplain. The chapel is located on the first floor of the main hospital building.